Relate: I have always known that I serve a powerful and capable God, but understanding has not always translated to a belief that God will be Lord of my circumstances. There have been times when I have wondered how I would pay the bills, times I have doubted God would answer if I prayed for healing, and times I questioned God’s ability to demonstrate love for me. Even though I had seen his mighty hand in action again and again, I doubted that God would act on my behalf. I repeatedly need God to come in his grace to heal my unbelief. React: The beauty of the story is that Jesus, although he expressed frustration with the people’s lack of belief, showed the father mercy and grace. When the man called out to him for help to overcome his unbelief, Jesus healed the boy. How often do we treat God with a “What have you done for me lately?” attitude? I am challenged to face each new trial with the question of how God will show up rather than if God will show up. God is able, and it is time for me to stop focusing on the trials ahead and to recall the victories behind me. The first step to healing unbelief is to ask for God’s help. We need to pray for our eyes to be opened to the faithfulness of our God. God, please help me to constantly cry out to you to increase my faith. Please help me to remember that you care about where I am and what I need in this moment. Thank you for the grace you give me when I fail to trust you. I do believe; help me to overcome my unbelief. Hi Rebecca: Christ proved His faithfulness throughout a five year journey He took me on to teach me to trust Him and obey Him. My first book is the story. “Laying Down my Net-A Walk of Faith.” You may be interested in reading it. It really shows His faithfulness in so many ways. If you’d like one you may purchase it on my website: http://www.elahministries.com Amazon is sold out. We all struggle with unbelief at times. It boils down to faith which is a choice. Good article. Thank you for the reminder. I have often focused on this verse, the story that leads to it. I have a strong faith but sometimes it is very fragile and I often beg God to increase it! I guess I have not asked for that lately. I have been struggling so much with depression and feeling distant from God (though I know he didn’t move). Thank you for the reminder! Good word! We all struggle in this area to some degree. That is why we must walk by faith and not by sight. I start each day in gratitude for all of the things that I have and for all of the things that I strive for as if I already have them ( inner peace, strength, courage, etc). The messages I receive when I meditate are always gentle and loving and I have no doubt that we are loved unconditionally and never alone. But we are still human and I understand how doubt seeps in, especially in trying times. May you know, truly know, that love surrounds you, that help is just a prayer away and that you have more strength, more knowledge, more grace than you ever imagined. Many blessings to you. Reblogged this on EbolAssist: an Orthodox response to Ebola. What an inspirational piece! There is no higher calling than active pursuit of God. Thank you. Whenever I consider “help my unbelief…” personally, I am always reminded that faith comes by hearing and hearing by the word of God. For me, that prayer is honest when I am receiving all the word God has prepared for me, I am meditating on it, and I am confessing that which He opens my eyes to. 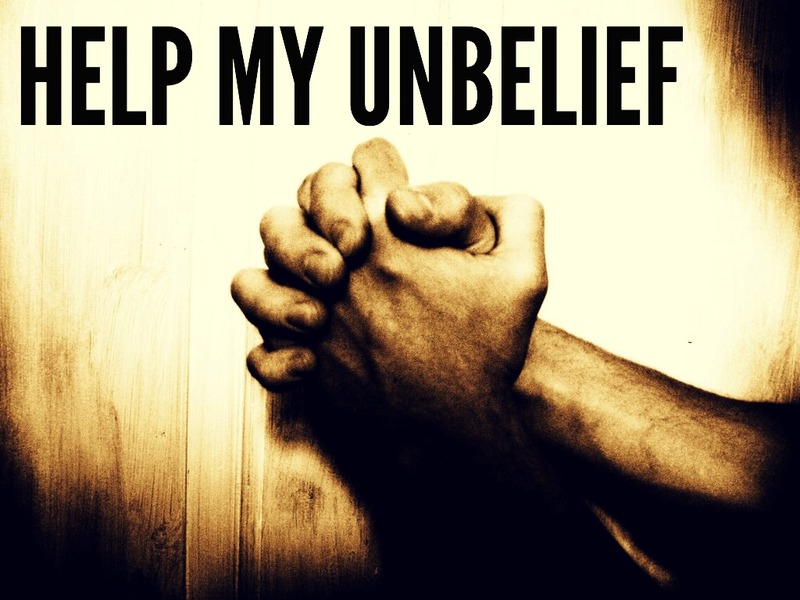 “Help my unbelief” is a lovely prayer that God made sure we could learn; I feel privileged to be able to pursue the answer to that prayer that God is constantly giving me. Awesome post! I’m a Chaplain in the Army and I have Mark 9:24 as my email signature. I need more faith every day! I truly enjoyed reading this piece as I believe that faith is a journey that we take each and everyday. Sometimes we get it right and other times we fail miserably. Thank God for His grace and unconditional love toward us that He is willing to wait patiently on His people. Rebecca, Paul tells us in Ephesians 1 that our God and Father is operating the all, according to the counsel of His will. This means he is operating the entire universe. We also read in Romans chapter 11 that the all is out of him, through him, and into him. What this means is, when the time is right, he gives us the ability to believe him. He operates in us to believe, to will, and to do what delights him. The prayer for help with unbelief comes from him. Then the belief comes from him according to his operation of all. Grace, peace, and much holy spirit to you. Great post. I’ve personally found unbelief to come from lack of connection to the soul. God is unconditional and universal. We are one with his love because of the soul. If we feel the need to have to look around then we’ve identified with the personality which is based on the feeling of lack. It then becomes easy to feel worthless. The miraculous identity of the soul is the anti-dote that heals our unconscious lack of self-worth.